SanTan Brewing Company knows that making great beer requires exceptional water, water that comes from the snow-capped mountains of northern Arizona. To ensure consistent quality of their award-winning Southwestern Style Ales and the longevity of their business, SanTan Brewing Company is teaming up with Crescent Crown Distributing and the National Forest Foundation (NFF) to launch “Tap to Top,” a campaign that helps Phoenix area residents understand where their water (and beer) comes from. The campaign promotes the Northern Arizona Forest Fund – a program that restores the National Forests in northern Arizona that provide clean, reliable water to the taps of valley residents and businesses. “The time to act to improve Arizona forests is NOW! It is simple: Healthy forests equal clean water, which SanTan Brewing uses to make the highest quality, freshest, local beer,” said Anthony Canecchia, founder and brewmaster, SanTan Brewing Company. Developed in partnership with the Salt River Project (SRP), the NFF’s Northern Arizona Forest Fund works with local governments, businesses and Arizona residents who want to invest in the lands and watersheds they depend on. The NFF then partners with the U.S. Forest Service, local nonprofits and private contractors to implement projects that reduce wildfire risk, improve streams and wetlands, enhance wildlife habitat, restore native plants, and limit erosion and sediment into Arizona streams, rivers and reservoirs. This year Northern Arizona Forest Fund projects reduced high-severity fire risk on more than 3,700 acres with prescription burning, and reduced erosion and sedimentation along, 31 miles of forest roads. Numerous other local businesses are also supporting the Northern Arizona Forest Fund to help protect the water sources that are vital to the success of their businesses and local communities. The “Tap to Top” campaign encourages individuals and businesses to support the Northern Arizona Forest Fund because maintaining watershed health is critical to the success of local businesses, the health and well-being of residents in the Phoenix-metro area, and to keeping fresh, local beer on tap across Arizona. Local beverage distributors, Finley Distributing and Canyon Distributing, have already committed to supporting “Tap to Top,” by making financial donations to support the Northern Arizona Forest Fund. 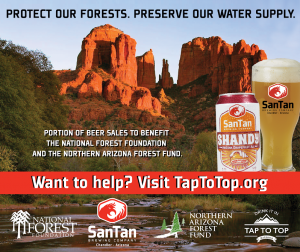 NFF, SanTan, and Crescent Crown Distributing are launching the “Tap to Top” campaign during Arizona Beer Week, encouraging beer lovers and the Arizona craft brewing industry to drink local beer and support the Northern Arizona Forest Fund. “Tap to Top” educational materials, including a short online video, are available at www.TapToTop.org. For more information on the “Tap to Top” campaign and the Northern Arizona Forest Fund, please contact Marcus Selig at mselig@nationalforests.org or visit www.NorthernArizonaForestFund.org or www.TaptoTop.org. Open since 2007 under the leadership of founder and brewmaster, Anthony Canecchia, SanTan Brewing Company has established a strong reputation as one of Arizona’s favorite craft breweries. In addition to brewing, SanTan features a friendly neighborhood brewpub in Downtown Chandler, which has quickly become one of the top local food and beer destinations in the Phoenix metro area. All SanTan Brewing Company craft beers are Southwestern Style Ales. SanTan’s brews are fermented to completion and carbonated higher than traditional American beers for a more effervescent, crisp and refreshing hand crafted beer – perfect for quenching your thirst in the hot Arizona sun and throughout the southwestern region of the US. In 2009, SanTan Brewing began distributing their Southwestern Style Ales throughout the state of Arizona, operating with a mission to pair craft beer with craft food that would inspire great conversation and good times. 2014 marks the beginning of taking this journey throughout the Southwest and California. SanTan beers have won numerous national and statewide awards including two medals at the US Open Beer Championship: bronze in 2013 and gold in 2011. SanTan Brewing also took home a silver medal at the 2011 Great American Beer Festival and won Best Brewery in Arizona, selected by the Phoenix New Times and the Arizona Republic, in 2013 and 2011. Check out SanTan Brewing Company online at www.SanTanBrewing.com and become a fan on Facebook at www.facebook.com/SanTanBrewingCo or follow them at www.twitter.com/SanTanBrewing.